As a mom to 3 kids, I’m all about casual weekday outfits. I like to look cute and stylish, while also being pretty comfortable. I spend a huge chunk of my day inside nursing and taking care of a baby, but also like to look put together when I run to the grocery store. Taking time to seek out perfect “tops” has really helped me be more intentional about my comfy/cute wardrobe. I’ve been on the edge of my seat watching the transformation of the Chris loves Julia cabin. From choosing the beam color to installing countertops, faucets, moving furniture in, making beds, drilling into the stone fireplace to hang the TV. Please start following them on Instagram so you can watch all the fun go down. Target, Amazon, J Crew + Mommy Mailbox! It’s my version of therapy. Treat yourself with a #mommymailbox waiting at your doorstep. Subscribe today at mommymailbox.com!!! I love pajamas. There, I said it. I mom all day and can’t wait to crawl into my pajamas as soon the kids are tucked into bed. But not all PJ’s are created equal, and I got a new pair for Christmas that take the cake. 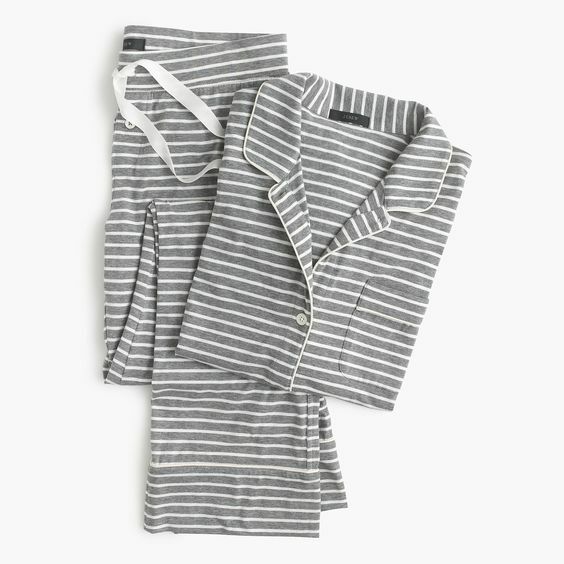 (I literally donated all my other PJ’s last week because none compare to these). They stretch, their super soft, very flattering and wash up beautifully. Best part, they offer petite sizes, for us short girls. And XL sizes too. So no matter your size, you can enjoy the best pajamas on the planet. Shop here. Download this list for yourself here. New Year = new goals. Is healthy eating one of yours? I just came across this article on The Everygirl, Why This Health Coach Recommends Whole30 to All Her Clients. I am a huge Whole30 fan. I’ve done the Whole 30 challenge a few times, I actually just did one between Thanksgiving and Christmas. Perfect way to not gain extra holiday weight. It is easier than you think! A lot of people do Whole 30 for weight loss, BUT the best part is how good it makes you feel. Whole 30 will give you loads of energy and get rid of your sugar cravings. Check out the article and read more about Whole 30 here. A Merry Christmas and a happy always. Thanks for the amazing year! Christmas will be here before you know it! Give a mom you know something to pamper her with every month with a subscription to Mommy Mailbox! Single boxes also available! Nothing hits the spot on a winter evening than a big pot of soup. This Cream Cheese Chicken Chili is loaded with everything good and is such a comforting meal. Take it to the next level and top with avocado, jalapenos and sour cream. Yum! Get the full recipe at The Cookie Rookie. I’m obsessed with pretty Christmas Cookies. Not that I have the patience to actually make them, but I dream…. …er…not sure what about? Possibly receiving them as a gift, and then the cookies looking beautiful in my kitchen and then me eating them. One thing I like to treat myself to this time of year is a custom calendar from Artifact Uprising. They are gorgeous keepsakes and something I enjoy all year long. I know you want to see more, so click here for more photos and details. Winter is here! I currently have a few inches of freshly fallen snow on my lawn and I am one of the people that love winter. My tried and true, go-to, mom-iform this time of year is a fleece pullover. It hits the balance of warmth, cozy and winter-chic. Can I just tell you how much I love Backcountry.com? They have everything + great prices (plus I can always find some sort of discount code). And I’m slightly biased because I live in Utah (and I think they are based out of Utah) SO I can order something and it arrives the very next morning! And this is not sponsored. I truly love Backcountry.com and buy so much there this time of year.